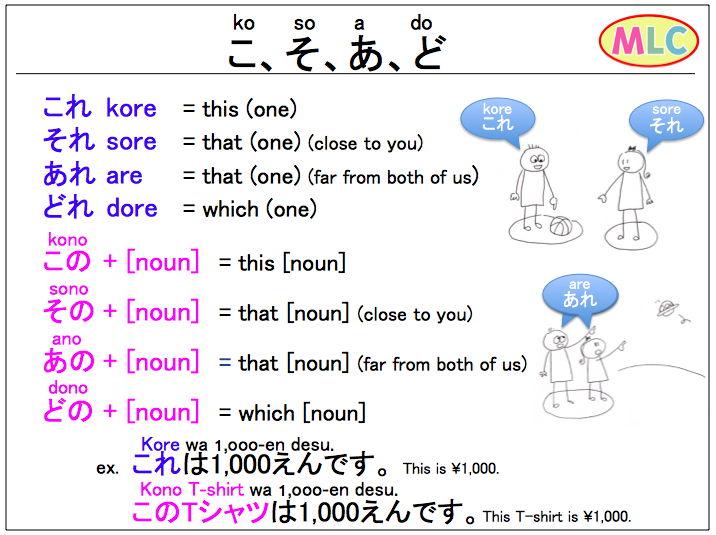 それ　sore　= that (one) "close to the listener"
あれ　are　= that (one) "far from both of us"
その sono + [noun] = that [noun] "close to the listener"
あの ano + [noun] = that [noun] "far from both of us"
ex. これは1,000えんです。Kore wa 1,000en desu. = This is 1,000 yen. ex. このTシャツは1,000えんです。Kono T-shatsu wa 1,000en desu. = This T-shirt is 1,000 yen. これは　とても　いいほんです。Kore wa totemo ii hon desu. = Lit. This is very good book. このほんは　とても　いいです。Kono hon wa totemo ii desu. = Lit. This book is very good. このサイトは　おもしろいです。Kono saito wa omoshiroi desu.= Lit. This is interesting (web)site. これは　おもしろいサイトです。Kore wa omoshiroi saito desu.= Lit. This (web)site is interesting. 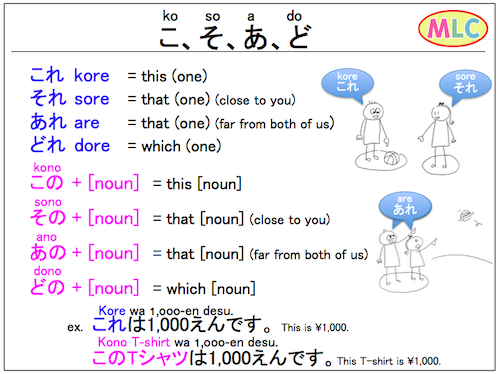 どれが　いいですか。Dore ga ii desu ka.= Lit.Which one is good (for you)? → Which one would you like? どのケーキが　いいですか。Dono keeki ga ii desu ka.= Lit. Which cake is good (for you)? どれが　おすすめですか。Dore ga osusume desu ka.= Lit.Which one is (your) recommendation? → Which one do you recommend? どのケーキが　おすすめですか。Dono keeki ga osusume desu ka.= Lit. Which cake is recommendation?